Zygmunt Bauman at the European Culture Congress, Wroclaw, Poland, September 2011.Wikicommons/Polish National Audiovisual Institute. Some rights reserved.Forgive me, this is as personal as it is political.I don’t know what to do. A world that was getting darker suddenly turned pitch black. 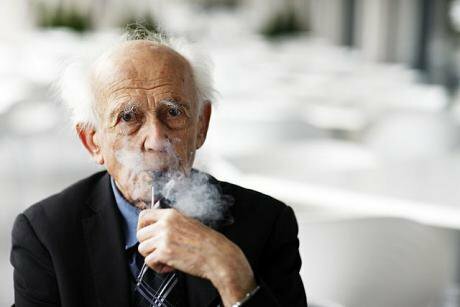 Zygmunt Bauman is dead. The towering intellectual colossus of our times and yet such a frail, slight and humble human being is gone. He lived an amazing life and was an amazing person. The brilliance of his mind and the warmth of his heart shone so strongly and clearly that even in these bleakest of times we had a person that could light the way to a good society. I first read Zygmunt properly at a formative moment, around 1998, just as I was groping towards a fundamental critique of New Labour. He helped me understand that the role of the poor isn’t just to be a reserve army to be called on when, and only when, the economy needed them; they existed to be humiliated and ‘Othered’, to police us to run endlessly on the treadmill of turbo-consumption for fear of being like them. As I watched New Labour divide the ‘deserving’ from the ‘undeserving’ poor, it was like a thunderbolt to my political soul. Reading Zygmunt can be tough – both in terms of the language but also the bleakness of some of his analysis. Some recoil. But staring into the abyss is the only way we prepare ourselves for the fight ahead. For me, there will be no more vodka at noon at his ramshackle home on the edge of Leeds, where he was Emeritus at the University for longer than he was employed there. There will be no more billowing pipe smoke as he pondered on what pearl of wisdom he was going to nudge you with next. There will be no more insightful articles (like these at Social Europe) or precision-bombed speeches and interviews shining his torch to the future. Momentarily there is a void. And we have to fill it. We will do so by taking his ideas, his insights and his enormous appetite for humanity and building on and shaping them. This personal open letter was written for Compass, and published on January 10, 2017.